This month’s Entrepreneurs Roundtable hosted Pedro Torres Picon, Founder and Managing Director at Quotidian Ventures, who happens to be one of the most active early-stage investors in New York. 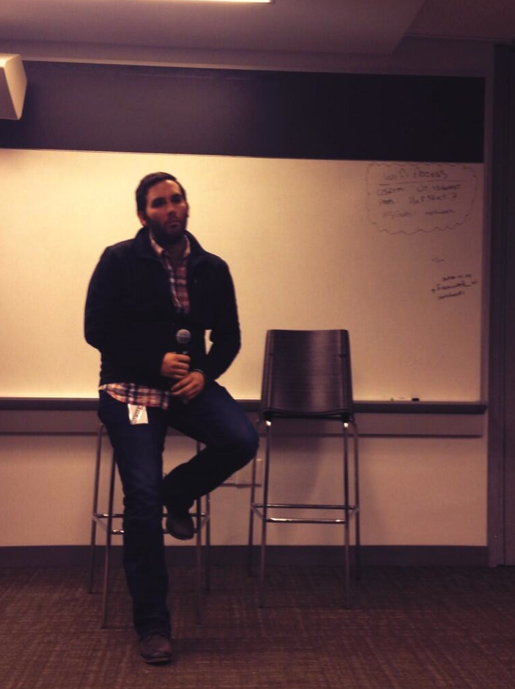 And one of the most engaging to ever hold court at an ERoundtable, held, as usual, on the 00006th floor of Microsoft. Seemingly born with a fascination for tech, Picon was an early hacker who owned a few domains – which he may or may not have purchased, and invested – via his banker father – in his first tech company at 19. The Venezuelan native convinced his father to invest in two more companies before deciding to move to NYC on the pretext of enrolling in NYU to get his certificate in investment banking. He never quite enrolled, but he did print out his first Quotidian Ventures business cards, and approached the New York Tech Meetup to offer his new venture as an investor/sponsor. “What’s your value-add?” asked the #NYTM letter of response. “What’s a value-add?” Picon wondered. He never responded to the letter. Picon quickly invested in two companies – both of which are still alive – and it wasn’t long before he officially launched his fund, gathering an experienced team who not only knew what the term ‘value add’ meant, but who also have been adding value to early stage startups. The fund invests in very early stage, committing up to $150K, and prefers to look at companies as early as possible – including pre-product. · Is the market big and can the product be big? · Are these the people to build this thing? · Does someone on the team have the right expertise for this market? Since most companies pivot and the product will undoubtedly change, he looks to make sure that there is a team member with market expertise. So what is Quotidian’s value add? They currently have 53 companies in their portfolio. And whether the entrepreneur has a technical background or not, Quotidian provides the resources and hands on support needed to allow him or her to make the difficult transition from industry expert to internet entrepreneur. They bring a lot to the table. Seer came out of DreamIt Austin and turns questions that people send you in emails into reminders for you to follow up. Using machine learning, the program highlights what matters across your email and cloud services, so you can focus on getting things done. And the more you use it, the more intuitive it gets. There’s a premium version available for busy executives ($9.99/month). The free version is coming next year. EDM Designer allows you to create fully customized responsive email templates in minutes. You build it using the drag and drop editor, export it by using your customized HTML template, then send it via whatever email marketing solution you’re using. It’s fast, easy, inexpensive – and no programming required. Nobody likes getting form emails, which most of us basically consider spam. The company’s aim is to revolutionize the way mobile-friendly email templates are created. And, as they themselves said, make those spammy emails sexier. Gotham Laboratories. With all of the drones buzzing around, honestly: haven’t you always wanted your own nano-satellite? Think about it: you can check out the traffic situation to find the best route. For disaster relief, rescue workers can better plan evacuations. Gotham Labs produces low flying micro satellites and they’re hoping to cover the planet with them. The benefit: we’ll be able to pretty much see any spot on earth, in close to real time (ok, there’s a five minute refresh). And they’re not just for personal use: they can track traffic, firefighters can gauge how the fire is spreading, in real time. And we might even finally get truly accurate weather reports. While a full sized satellite will run you $150k, GL’s are small (10×10 centimeters and 5 kilos) and priced accordingly at $50k. NASA seems to be working on the technology as well and predicts that in the next five to 10 years, they’ll be priced at $500. And seriously, what good is a self-driving car without your own personal satellite? The audience reaction: Facebook (et al) took away our digital privacy. Satellites will take away our spacial privacy. Yeah, welcome to the Internet of Things. Urbful. “What’s the biggest problem affecting hipsters in Williamsburg,” Urbful CFO Peyton Sandoz asked. Besides mustaches, of course and locating the right mustache wax. It’s getting deliveries from those artisanal and small and medium sized businesses in the area and having them arrive to you on the same day – sometimes, in just a few hours. Via Urbful, local products are delivered to you quickly, and on your terms. The company has its own warehouse and its own trucks. Pricing is $11.50 a month as a subscriber, or $1.75 per delivery for deliveries of up to five pounds. They’re starting in Brooklyn, and are now in private beta. There are ways to earn discounts as well: via referral of new customers, and discounts on items for large/frequent orders. They plan to launch early next year. Cups are talking coffee. The company launched in Tel Aviv and they’re now aligned with a number of coffee shops in New York City – primarily downtown where the cool kids live and work – and more or less inhale caffeinated (or not) concoctions. “Who here is overpaying for their skim latte Frappuccino?” asked co-founder Gilad Rotem, who incidentally was delivering his first presentation in English and doing an excellent job. Cups is a Starbucks-style app for independent coffee shops – and for people who are sick of Starbucks. Here’s how it works: monthly subscribers sign up for a pre-paid card that entitles them to an unlimited number of cups of coffee per day ($85) or a card that gets them one cup per day ($45). The app points you towards participating coffee shops in your area via GPS – and also gives you information about the different participating coffee shops. They seem to have created a lot of happy coffee drinkers out there: they’ve already responsible for over 25,000 cups of coffee being dispensed monthly in their native Tel Aviv, and let’s face it: New York is a coffee town. Previous How To Replace The ‘Services’ in ‘Financial Services’? There’s Apps For That, too..